Happy 2015 and what a year it has been already! The weather for most of the northeast has been, well, the worst than any of us can remember and not in a good way. Snow, wind, bitter cold all add up to bone-chilling numbness that doesn’t want to lose its grip. So, what can be done to avoid so much winter??? Take a nice long vacation! Yup, that’s about it. So, I hope you are able to do just that because everyone deserves a break from it, even if your schedule allows only a short time away. That’s pretty much what we did and feel very grateful because this winter is BAD. It’s good for the soul to defrost and feel alive again! And, being in a warmer clime brought an opportunity to have my son, Josh – a talented web designer – visit us for a while. What a wonderful treat in so many ways! 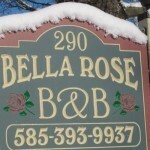 Not only do we get to have some long overdue “catch up time”, but it allowed him time “to do what he does best” on our Bella Rose B&B website. He waved his magic wand (or so it seemed to me), and a new website appeared! It’s fresh, new, interesting, and downright snappy. It’s definitely worth giving it a good thorough look-see! Yes, 2015 promises to be a great year in Canandaigua, regardless of the weather now. Soon we will be meeting and greeting friends, old and new, and it will be fun. Right now, however, we are grateful to be enjoying a long winter thaw, visiting with family and friends, and enjoying the fruits of Josh’s labor on our labor of love, Bella Rose. How lucky are we? Very. See you in the Spring!